Hi friend! I hope you’ve been having a fabulous week! 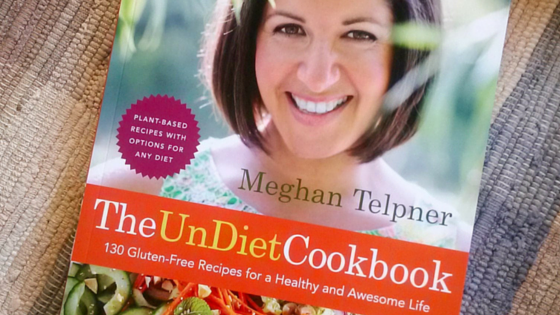 Today I am sharing a totally biased review of Meghan Telpner’s Undiet Cookbook: 130 Gluten-Free Recipes for a Healthy and Awesome Life. My review is going to be biased because having worked and learned from Meghan over the last 3 (now 5!) years, starting with my CNE course at the Academy of Culinary Nutrition and spanning Biz Rockin’ classes, Urban Retreats, and now working as a program coach for the very same Culinary Nutrition Expert Program, I can tell you without a shadow of doubt that Meghan is the real deal. First off, I work with a lot of clients who are interested in taking their health to the next level, so I am always looking for great foundational texts to recommend to help them begin their journey. Since Meghan’s first book, Undiet, was published it has been one of my go-to recommendations and the new companion cookbook completes the set to provide the most absolute, easy-to-implement lifestyle changes required for long lasting health. As soon as you open this book the beautiful photography, amazing colours, and sheer joy that radiates from every page will captivate you. You will likely also want to raid Meghan’s closet. Short review: Buy this book. Your waistline, brain, and taste buds will thank you for the rest of your days. It is so much more than a cookbook; it is a roadmap to health, happiness, and total enjoyment of life. For the long review of why this book is just so awesome, keep reading. 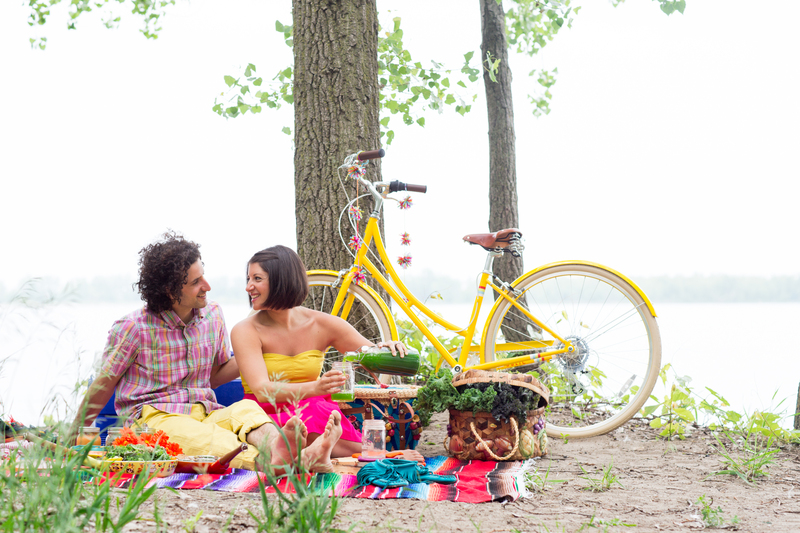 The Undiet Cookbook is divided into three main sections: Introduction, Recipes, and Lifestyle. The introduction helps you get into the proper frame of mind to fully absorb and assimilate all the Undiet wisdom she will be dropping throughout the next 300 pages, including what you need to know before you get into the kitchen. As we read through the introduction Meghan gently, but firmly reminds us of a few simple, but often difficult to grasp, truths in the nutrition world: No one diet is going to work for everyone and you are the only one who is responsible for your health and well-being. It is these truths upon which the rest of the information is built and Meghan uses her characteristic charm and light heartedness to hit at the core of a major issue in the nutrition world: most people are not willing to take their health into their own hands. But fear not my friend, because she is here to cheerlead you all the way to awesometown, fill you up with empowering knowledge and delicious food, and make you laugh and smile every step of the way! For Meghan, being healthy doesn’t just mean dutifully eating kale salads and drinking green juices every day, it means enjoying the process, making time for friends and loved ones, getting clear on our purpose in life, and helping spread love and cheer across the globe. I told you the photos in this book are incredible. There are a few simple rules to follow such as avoiding foods that passed through a chemical lab or processing facility, ditching any foods that have ridiculous health claims, something she calls “healthwashing,” and steering clear of foods that have to prove they won’t kill you. Nothing revelatory, nothing too difficult, just an honest return to real whole foods. Within this paradigm she gives you the ability to figure out what whole foods make you thrive until you have created an optimal diet for you, not for your friends, neighbours, or loved ones. You will leave this section completely in love with the Undiet philosophy not only because of the freedom it offers from restriction, calorie counting, and deprivation, but also due to the fuchsia pink sunglasses Meghan hands out at the door to the party. The Undiet way of living is based upon the belief that all diets should be “Plantiful.” That means that they are composed mostly of unprocessed plant foods, nuts, seeds, small doses of fruit, possibly some prepared gluten-free grains and sprouted beans and lentils. Every choice in the Undiet lifestyle is designed to improve the health of ourselves and the planet, so a focus on local, organic, sustainably raised and/or produced foods is part of the philosophy. All of the recipes in the Undiet Cookbook are gluten-free, dairy-free, and free of ingredients that have long lists of ingredients. Most of the recipes offer options to go fully vegan/vegetarian or to adapt to your needs and add more animal sources of protein. Her goal is to be inclusive and let the you decide what works best for your body, not to tell you that in order to be healthy you MUST eat this one particular way. Her “Labels are for Tin Cans” philosophy encourages you to be non-judgmental in your approach to nutrition and to avoid tying your personality to a particular way of eating, as your needs may change over time and what worked for you at one point may not work further down the line. She goes into really clear detail on why you should be eliminating gluten from your diet, citing studies and changes in wheat chromosomes. From there she gives you a clear list of the foods that most commonly contain gluten. This resource is fantastic if you have just gone gluten free. She also offers a primer on gluten-free eating; definitions of new terms you may not be familiar with; how, when, and what kind of dairy to incorporate; how to properly stock your pantry; why you should no longer be on the fat-fearing bandwagon and how to choose the right fats for your diet; how to get your kitchen Undiet ready, including what to ditch and what to buy. Ah, now sweet readers we get to the beans and veggies of the book: The recipes! Her book is divided into clear sections, which include Decadent Drinks; Dips, Crackers, and Spreads; Condiments, Dressings, and Special Wonders; in addition to the staples of soups, salads, brekkies, mains, and desserts. As soon as you dive into these recipes you will want to run to your kitchen and immediately start slicing, dicing, juicing, roasting, and pureeing like a mad woman. Another gorgeous shot from the cookbook. This one features the Zucchini Hummus and a few other goodies. I happen to know that this is one of Meghan’s favourite pics from the whole book. Brain-Fuel Smoothie—full of nutty, awesome goodness to start your day! Uncoffee—Now I will admit I was never a coffee drinker, but this spicy, rich and creamy beverage will give you an energy boost without the awful caffeine crash. Everybody wins! Breakfast Parfection—I loved the concept of using banana, avocado, hemp, and coconut oil to make a tummy-loving, brain-fueling yogurt as the base of this parfait. Sweet Potato Zucchini Hash Brizzles—Anything crispy and crunchy that reminds me of hash browns gets an A+ in my books! I used the grain-free option and they were delicious. Sesame Orange Crisps—Think making your own crackers is too hard? This recipe proves that is deliciously and patently untrue. The six menu plans for entertaining guests at everything from a Taco Night to brunch to a girls night is a great tool for those of us who may not have quite the party planning acumen as Meghan. 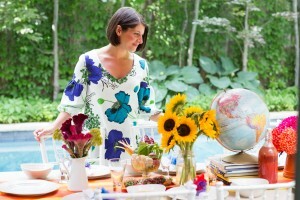 She’s laid out recipes and a handy prep schedule for each event, plus tips on decorating and hosting. It’s a great little guide to have! Learn how to entertain like an Undiet Rockstar and use these gorgeous cookbook photos as inspiration! Taking Undiet living on the road is a breeze thanks to the sweet tips Meghan shares in this section on how to stay healthy while traveling. This cookbook is an incredible guide toward more whole, healthy, and happy living that has earned a place of honour on my bookshelf. Meghan has once again created a resource that you can easily use, regardless of whether you have years of nutrition training or are just starting to dip your toes into the healthy living world. If we aren’t enjoying the process, feeling nourished, vibrant, energized, and ultimately happy, then we are missing something big, mighty, urgent, and important. 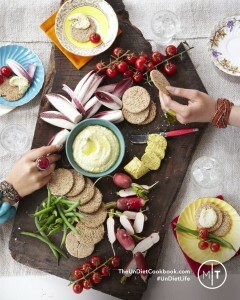 Here is a snapshot of some of the beautiful photography and delicious recipes include in the Undiet Cookbook. This is a photo of the Rawmazing Key Lime Pie. YUM! Put all the crust ingredients into a food processor, and process until the ingredients can just stick together. You shouldn’t have a gooey mess. Stop and scrape down the sides as needed. 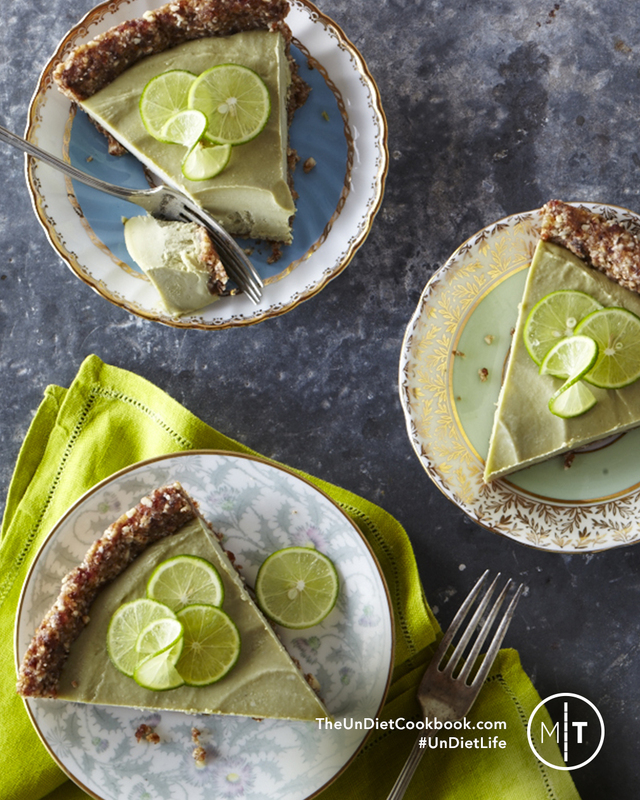 Press the crust mixture into the bottom and up the sides of a 9 ­inch glass pie dish. Meghan Telpner is a Toronto-based author, speaker, nutritionist, and founder of the Academy of Culinary Nutrition. Her humorous, engaging and real approach to living a healthy and awesome life has garnered her a world-wide following and extensive media attention. Meghan’s Academy of Culinary Nutrition, is growing a global tribe of vibrant living advocates and her bestselling and award-winning book UnDiet: Eat Your Way to Vibrant Health and the follow-up The UnDiet Cookbook is creating a revolution in how people think about their health. 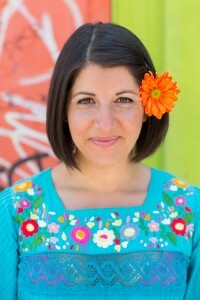 With an equal passion for both vibrant living and good karma business, Meghan works with health focused independent practitioners and small businesses to find their unique voice in a crowded marketplace, stay ahead of the curve, cultivate community and convert passion into profitable conscious business. Thank you Caitlin for this thoughtful, detailed and generous review of my book. I’m truly honoured by your words! It is absolutely my pleasure Meghan! I may have canceled my plans last night to stay in and make the Almond Veggie Burgers and Creamy Zucchini Hummus… So good!! !